As you can see, I am having an issue with my height map. My machine is a max metal, with trick laser trucks and CF arms (ball cup). I was using FSRs, but changed to the IR because I thought they were the issue. My belts and trucks are tight, the effector is not tilting and my build plate is flat. I included two height maps, 15 & 20mm spacings, so you can see the problem. I removed the bowden tube and the electronics (hotend heater and thermistor wires) in order to eliminate as many variables as possible. When the effector is moving on the X axis only, the height increases (blue to red). This happens in both directions, right to left and left to right. I am hoping someone has had this problem before and knows how to fix it. Dang, another trick laser issue. Are you using their effector too? Do you have a way to measure the width of the diagonal arms at the top, by the carriage and at the bottom near the effector? I also like to see what rod difference you get when running a 6 factor auto calibration versus a 9 factor. You don't need to save either setting, just post the M665 and M666 after each. Thanks. I have seen that before. My best guess is that it is caused by backlash somewhere in the mechanics, or possibly springs between the rods changing position on the arms. I put the original Rostock MAX ball cup injection molded arms back on and ran another height map. Unfortunately, it looked the same. Crap, Rostock and Trick Laser. Double whammy. Yourself and superpotatofudge need to get together in one thread and compare some measurements. I reinstalled the molded plastic trucks from seemecnc, and this is what I got. I have spent too much time and $ on this mess, so it's time to start from scratch and build David's large Kossel. That sounds like a better route. I used his build as a guideline, but strayed here and there. 394mm bed plate diameter. Slowly but surely I built a new delta based on David's plans. On the second calibration, it calculated the deviation at 0.016. I am still waiting on my heat plate from China, but here is the first height map produced from this printer. I have not made any adjustments and the build plate is not even anchored to the frame. 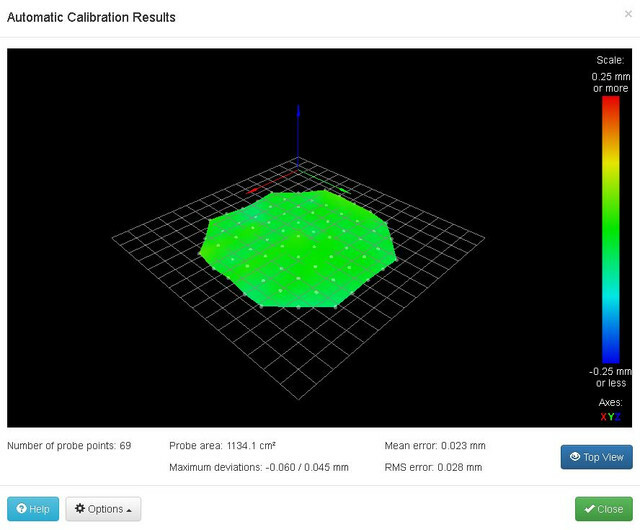 Now I just hope it prints as well as it calibrates. David, THANKS for such great products and instructions! For those interested, I followed David's build instructions and added the smart effector. Nice!! Gotta love that flat map.